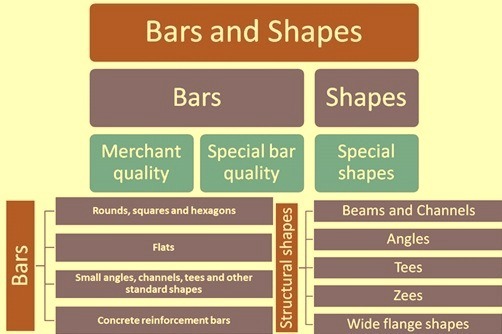 The term ‘bar’ includes (i) rounds, squares, hexagons, and similar cross sections 10 mm and greater across, (ii) flats greater than 5 mm in thickness and 150 mm and less in width or greater than 6 mm in thickness and 200 mm and less in width, (iii) small angles, channels, tees, and other standard shapes less than equal to 75 mm across, and (iv) concrete reinforcement bars. The term ‘shape’ includes structural shapes and special shapes. Structural shapes are flanged, are 80 mm or greater in at least one cross-sectional dimension, and are used in structures such as bridges, buildings, ships, and railway wagons. Special shapes are those designed by users for specific applications. Fig 1 shows various types of hot rolled bars and shapes. The nominal dimensions of hot-rolled steel bars and shapes are designated in millimeters with applicable tolerances, as shown in the applicable standards. Bars or shapes can be cut to length in the rolling mill by a number of methods, such as hot or cold shearing or sawing. The method used is determined by cross section, grade, and customer requirements. Some end distortion is to be expected from most methods. When greater accuracy in length or freedom from distortion is required, bars of shapes are normally cut over-length, and then recut on one or both ends by cold sawing or equivalent means. If a bar or shape requires straightening, prior annealing is sometimes necessary, depending on the grade of steel and the cross-sectional shape of the part. The processing necessary to meet straightness tolerances is not intended to improve either the surface finish or accuracy of cross-sectional shape and may result in increased surface hardness. Length and straightness tolerances for bars and shapes are normally given in the applicable standards. Most carbon (C) steel and alloy steel hot rolled bars and shapes contain surface defects with varying degrees of severity. In virtually all cases, these defects are undesirable and may in some applications affect the integrity of the finished product. During the manufacturing process for hot rolled bars and shapes various steps are taken to minimize or eliminate surface defects. These steps include inspection of both the semi-finished and the finished products and either subsequent removal of the defects or rejection of the material, if defect removal is not possible. Inspection techniques range from visual inspection of the semi-finished material to sophisticated electronic inspection of the finished product. Defects found in the semi-finished product can be removed by hot scarfing, grinding, or chipping. Defects in the finished products are generally removed by grinding, turning, or peeling and, to a lesser degree, by chipping. Presently, it is not technically feasible to produce defect free hot rolled bars. With the current demand for high quality bar products, it is becoming increasingly common to subject hot rolled bars to a cold finishing operation, such as turning or grinding, coupled with a sensitive electronic inspection. With this process route, it becomes possible to significantly reduce both the frequency and the severity of surface defects. Seams, laps, and slivers are probably the most common defects in hot rolled bars and shapes. Seams are longitudinal defects that can vary greatly in length and depth. It is quite common for steel users to refer to any longitudinal defect as a seam regardless of the true nature of the defect. The defect of seam occurs because of the following reason. Gas comes out of the solution as the liquid steel solidifies. This gas is trapped as bubbles or blowholes by the solidifying steel and appears as small holes under the surface of the steel. When the steel is reheated, some areas of the surface may scale off, exposing and oxidizing the interior of these blowholes. This oxidation prevents the blowholes from welding shut during rolling. This rolling then elongates the steel, resulting in a longitudinal surface discontinuity which is known as a seam. As viewed in the cross section, seams are generally characterized as being perpendicular to the surface, completely surrounded by decarburization, and associated with disperse oxides. Laps are mechanical defects occurring during the hot rolling of both semi-finished and finished products. Laps are due to the folding over of the material, resulting, for example, from gouging during the rolling process or misalignment of the pass lines or rolls. As viewed in the cross section, laps are characterized as being at an angle from the steel surface. The laps have decarburization on one side only of the defect and often contain entrapped scale. Slivers appear normally as a scab like defect, adhering on one end to the surface of the hot rolled steel. They are normally pressed into the surface during hot rolling. They can originate from short, rolled out defects such as torn corners that are not removed during conditioning. They can also result from conditioning gouges or mechanical gouges during rolling. Although there is no specific metallographic definition of slivers, metallographic examination can be used to determine the origin of these defects. Decarburization of the surface is another condition that could be considered a surface defect. This condition is present to some degree on all hot rolled steel. Decarburization occurs at very high temperatures when the surface C of the steel reacts with the oxygen (O2) in the atmosphere of the reheating furnace. This loss of surface C results in a surface that is softer and unsuitable for any application involving wear or fatigue. Because of the existence of this condition, steel bars needed for critical applications can be produced oversize and then ground to desired size. Normally the users of hot rolled or heat treated steel bars which are required to be machined usually procure bars specifying sizes after making adequate allowances for the removal of surface defects. These allowances depend on the way the surface metal is removed, the length and size of the bars, the straightness, the size tolerance, and the out-of-round tolerance. Bars are generally straightened before machining. It is uncommon for hot rolled steel bars and shapes to be descaled by the producer or protected from the weather during transit. Most cleaning and coating operations are done either by the user or by an intermediate processor. Descaling of hot rolled bars and shapes is generally done by either pickling or blasting, depending on the end use. There are several subsequent coatings that can be used. Oil is both the simplest and the least expensive to use and acts as a temporary rust preventive material. Lime, besides serving as a rust preventive material, can serve as a carrier for lubricants used during cold drawing or cold forging. A more sophisticated system includes descaling, followed by a zinc phosphate coating, coupled with a dry lubricant. This system provides some rust protection and serves as a lubricant for cold forming operations. Hot rolled low C and medium C steel bars and shapes are often used in as rolled condition, but hot rolled bars of higher C steel and most hot rolled alloy steel bars must be heat treated in order to attain the hardness and microstructure best suited for the final product or to make them suitable for processing. Such heat treatment consists of one or more of the following processes namely (i) annealing, (ii) stress relieving, (iii) normalizing, (iv) quenching, and (v) tempering. Ordinary annealing is the term generally applied to heat treatment used to soften steel. The steel is heated to a suitable temperature, held there for some period of time, and then cooled; specific times, temperatures, and cooling rates vary. Maximum hardness compatible with normal practice is generally specified. Annealing for specified microstructures is usually performed to obtain improved machinability or cold forming characteristics. The microstructures produced may consist of lamellar pearlite or spheroidized carbides. Special control of the time and temperature cycles is necessary. Stress relieving involves heating to a sub-critical temperature and then cooling. For hot rolled bars, the principal reason for stress relieving is to minimize distortion in subsequent machining. It is used to relieve the stresses resulting from cold working operations, such as special machine straightening. Normalizing involves heating to a temperature above the critical temperature range and then cooling in air. A compatible maximum hardness is generally specified. Hardening by quenching consists of heating steel to the correct austenitizing temperature, holding at that temperature for a sufficient time to produce homogeneous austenite, and quenching in a suitable medium (water, oil, synthetic oil or polymer, molten salts, or low-melting metals) depending on chemical composition and section thickness. Tempering is an operation performed on normalized or quenched steel bars. In this technique, the bars are reheated to a predetermined temperature below the critical range and then cooled under suitable conditions. When a hardness requirement is specified for normalized and tempered bars, the bars are ordinarily produced to a range of hardnesses equivalent to a 0.4 mm range of Brinell impression diameters. Quenched and tempered bars are ordinarily produced to a 0.3 mm range of Brinell impression diameters. Quenched and tempered bars are also produced to minimum mechanical property requirements. Hot rolled steel bars and shapes are produced to chemical composition ranges or limits, mechanical property requirements, or both. The mechanical testing of hot rolled steel bars and shapes include tensile, Brinell or Rockwell hardness, bend, Charpy impact, fracture toughness, and short-time elevated temperature tests, as well as test for elastic limit, proportional limit, and offset yield strength, which require the use of an extensometer or plotting of a stress-strain curve. These tests are performed based on the requirements of the standards. Other tests sometimes required include the measurement of grain size and hardenability. Austenitic grain size is determined by the McQuaid-Ehn test. In this test the steel is examined not for its actual grain size while being tested but to discover what its grain size had been previously, namely when it consisted of crystals of austenite, at high temperature. This test involves metallographic examination of a carburized specimen to observe prior austenitic grain boundaries. Hardenability can be measured by several methods, the most common being the Jominy end-quench test. Soundness and homogeneity is generally evaluated by fracturing. The fracture test is commonly applied only to high C bearing quality steel bars. Location of samples, number of tests, details of testing technique, and acceptance limits based on the test need to be established in each instance. Testing for nonmetallic inclusions consists of careful microscopic examination (at 100×) of prepared and polished specimens. The specimens are to be taken on a longitudinal plane midway between the centre and surface of the steel bars and shapes. Location of specimens, number of tests, and interpretation of results need to be established in each instance. Typical testing procedures are described in the applicable standards. Nonmetallic inclusion content can also be measured on the macroscopic scale by magnetic particle tests. These tests involve the measurement of inclusion frequency and severity in a sampling scheme that represents the interior of the material. Surface and subsurface non uniformities are revealed by magnetic particle testing. This test has been developed for, and is used on, fully machined or ground surfaces of finished parts. When the magnetic particle test is to be applied to bar stock, short-length samples are to be heat treated and completely machined or ground. Tensile and hardness tests are the most common mechanical tests performed on hot rolled steel bars and shapes. Hardness is a relatively simple property to measure, and it is closely related to tensile strength. A simple hardness test can give an estimate of yield strength and elongation, as well as the tensile strength. It is not practicable to set definite limitations on tensile strength or hardness for C or alloy steel bars in the as-rolled condition. For mill-annealed steel bars, there is a maximum tensile strength or a maximum hardness that can be expected for each grade of steel. For steel bars in the normalized condition, maximum hardness, maximum tensile strength, minimum hardness, or minimum tensile strength are generally specified. For normalized and tempered steel bars and for quenched and tempered steel bars, either maximum and minimum hardness, or maximum and minimum tensile strength are specified. For either property, the range that can be specified varies with tensile strength and is equivalent to a 0.4 mm range of Brinell impression diameters at any specified location for normalized and tempered bars and to a 0.3 mm range for quenched and tempered bars. It is essential that while procuring the bars, the positions at which hardness readings are to be taken, are specified. When both hardness and tensile strength are specified at the same position, the limits need to be consistent with each other. When hardness limits are specified as surface values, they may be inconsistent with tensile test values, which of necessity are properties of the bulk metal; the inconsistency can vary according to the size of the bar and the hardenability of the steel. The procurer is required to specify limits that take this inconsistency into account. If the locations of hardness readings are not specified by the procurer then the hardness values are applicable to the bar surface after removal of decarburization. Hardness correction factors for steel bars of various diameters as described in various standards are usually applied if a flat area is not available on the bar tested. Generally, yield strength, elongation, and reduction in area are specified as minimums for steel only in the quenched and tempered or the normalized and tempered condition, and they are to be consistent with ultimate tensile strength (UTS) or hardness. When quenched and tempered steel bars are cold worked by cold straightening, stress relieving may be required to restore elastic properties and to improve ductility. Hot rolled C steel bars are produced to two primary quality levels namely (i) merchant bars, and (ii) special bar quality (SBQ) bars. Merchant bars have lower quality levels and are not suitable for those uses where internal soundness or freedom from surface defects is of primary importance. SBQ bars includes all bar categories with restrictive quality requirements for the end use. The mechanical properties of hot rolled C steel bars and shapes in the as-rolled condition are influenced by: the following. Carbon content is normally the dominant factor. The minimum expected mechanical properties of frequently used grades of hot rolled C steel bars and shapes are those which are normally included in the standards. Quality specifications for hot rolled alloy steel bars are related to suitability for specific applications. Characteristics considered include inclusion content, uniformity of chemical composition, and freedom from surface defects. C steel and alloy steel structural shapes and special shapes do not normally have specific quality specifications but are covered by several standards. Merchant quality is the least restrictive specification for the hot rolled C steel bars. Merchant quality bars are used in the production of noncritical parts of bridges, buildings, ships, agricultural implements, road-building equipment, railway equipment, and general machinery. These applications require only mild cold bending, mild hot forming, punching, and welding. Mild cold bending is bending in which a large bend radius is used and in which the axis of the bend is at right angles to the direction of rolling. Merchant quality steel bars are to be free from visible pipe. However, they may contain distinct chemical segregation, and for this reason, product analysis tolerances are not appropriate. Internal porosity, surface seams, and other surface irregularities may be present and are generally expected in bars of this quality. Consequently, merchant quality bars are not suitable for applications that involve forging, heat treatment, or other operations in which internal soundness or freedom from surface imperfections is of primary importance. Merchant quality steel bars are generally produced to meet both chemical composition (heat analysis only) and mechanical properties. These steels can be supplied to chemical compositions within the ranges of C- 0.50 % max, Mn (manganese) – 0.60 % max, P (phosphorus) – 0.04 % max and S (sulphur) 0.05 % max, but are not produced to meet any specific Si (silicon) content, grain size, or any other requirement in the steel. Merchant quality steel bars do not require the chemical ranges typical of standard steels. They are produced to wider C and Mn ranges and are usually designated by the prefix ‘M’. When procuring merchant quality bars to meet mechanical properties, the strength ranges which are to be used up to a maximum of 655 N/sq mm are (i) 70 N/sq mm for minimums up to but not including 415 N/sq mm, (ii) 80 N/sq mm for minimums from 415 N/sq mm up to but not including 460 N/sq mm, and (iii) 100 N/sq mm for minimums from 460 N/sq mm to 550 N/sq mm. Different standards defines the requirements for hot rolled merchant quality C steel bars and bar-size shapes intended for noncritical constructional applications. Merchant quality steel rounds are not produced in diameters greater than 75 mm. SBQ bars are used when end use, method of fabrication, or subsequent processing treatment requires characteristics not available in merchant quality steel bars. Typical applications, including many structural uses, require hot forging, heat treatment, cold drawing, cold forming, and machining. These bars are required to be free from visible pipe and excessive chemical segregation. Also, they are rolled from billets that have been inspected and conditioned, as necessary, to minimize surface defects. Frequency and degree of surface defects are influenced by chemical composition, type of steel, and bar size. Resulphurized grades, certain low C killed steels, and boron (B) treated steels are most susceptible to surface defects. Some end uses or fabricating procedures can necessitate one or more extra requirements. These requirements include special hardenability, internal soundness, nonmetallic inclusion rating, and surface condition and are described in the standards. The quality specification for bars to which only one of these special requirements is applied is the ‘restrictive requirements’ of the quality. The restrictive requirements can be a single special restriction or more. Multiple restrictive requirement SBQ bars are those to which two or more restrictive requirements are applied. SBQ quality steel bars can be produced using rimmed, capped, semi-killed, or killed deoxidation practice. The appropriate type is dependent on chemical composition, quality, and customer specifications. Killed steels can be produced to coarse or fine austenitic grain size. SBQ quality steel bars are produced to product chemical composition tolerances and are normally purchased on the basis of heat composition. SBQ quality steel bars can also be produced to meet mechanical property requirements. The tensile strength ranges are similar to those applicable for the merchant quality bars. Additional requirements for the mechanical property and test frequencies in the specifications are usually included in the applicable standards. SBQ quality steel bars are commonly produced in the following sizes. Normal size ranges have not been established for SBQ quality bars of other shapes, including bar-size shapes, ovals, half-ovals, half-rounds, octagons, and special bar-size shapes. Cold working quality is the specification ( includes scrap-less nut, cold forging, cold heading, and cold extrusion qualities) for hot rolled bars used in the production of solid or hollow shapes by means of severe cold plastic deformation, such as (but not limited to) upsetting, heading, forging, and forward or backward extrusion involving movement of metal by expansion and/or compression. Such processing normally involves special inspection standards and requires sound steel of special surface quality and uniform chemical composition. If steel of the type or chemical composition specified does not have adequate cold-forming characteristics in the as-rolled condition, then a suitable heat treatment, such as annealing or spheroidize annealing, is necessary. SBQ bars of axle shaft quality are produced for the manufacture of power-driven axle shafts for automobiles. Because of their design or method of manufacture, these axles either are not machined all over or undergo less than the recommended amount of stock removal for proper cleanup of normal surface imperfections. Therefore, it is necessary to minimize the presence of harmful surface defects in bars of axle shaft quality through the use of special rolling practices, special billet and bar conditioning, and selective inspection. In case of cold-shearing quality bars, there are limits to the sizes of hot rolled steel bars that can normally be cold sheared without specially controlled production procedures. When the cold shearing of larger bars is desirable, it is recommended that cold shearing quality bars be procured. Bars of this quality have characteristics that prevent cracking even in these larger sizes. Cold-shearing quality bars are not produced to specific requirements such as hardness, microstructure, shear life, or productivity. Maximum size (cross-sectional area) limitations for the cold shearing of hot rolled steel bars without the specially controlled production procedures, and of cold-shearing quality bars, are given in the standards. If even larger bars are to be cold sheared, cold-shearing behaviour can be further improved by suitable prior heat treatment. Additional qualities of C steel bars are rolled for specific requirements. Such qualities are related to application and processing. These qualities include (i) file quality, (ii) gun barrel quality, (iii) gun receiver quality, and (iv) shell steel qualities for different shells. Hot rolled alloy steel bars are generally produced in the same size as SBQ quality steel bars. Common size ranges have not been established for other shapes of hot rolled alloy steel bar, including bar-size shapes, ovals, half-ovals, half-rounds, octagons, and special bar-size shapes. Hot-rolled alloy steel bars are covered by several standards. Hot rolled alloy steel bars are also covered by several quality specifications as discussed below. These quality specifications differentiate bars on the basis of characteristic properties required to meet the particular conditions encountered during fabrication or use. Regular quality is the basic or standard quality for hot rolled alloy steel bars. Steel for this quality are killed, are usually produced to fine grain size, and are melted to chemical composition limits. Bars of this quality are inspected, conditioned, and tested to meet the normal requirements for regular construction applications for which alloy steel is used. Alloy steel bars of axle shaft quality are similar to C steel bars of the same quality. Also alloy steel bars of cold shearing quality are similar to C steel bars of the same quality. Ball and roller bearing quality and bearing quality apply to alloy steel bars intended for antifriction bearings. These bars are usually made from steels of standard alloy carburizing grades and high C chromium (Cr) grades. Bearing quality steel bars require restricted melting and special teeming, heating, rolling, cooling, and conditioning practices to meet rigid quality standards. Steelmaking practices may include vacuum treatment. The foregoing requirements include thorough examination for internal defects by one or more of such methods as macro-etch testing, microscopic examination for nonmetallic inclusions, ultrasonic inspection, and fracture testing. It is not practical to furnish bearing quality steel bars in sizes exceeding in cross-sectional area of 250 mm square bar to the same rigid requirements as those for bars in smaller sizes because of insufficient hot working in the larger bars. Usually, bars over 100 mm in thickness are forged to 100 mm square or smaller for testing. Cold working quality (cold heading quality and special cold-heading quality) of hot rolled bars are used in the production of solid or hollow shapes by means of severe cold plastic deformation, such as (but not limited to) upsetting, heading, forging, and forward or backward extrusion involving movement of metal by expansion and/or compression. Such processing normally involves special inspection standards and requires sound steel of special surface quality and uniform chemical composition. If steel of the type or chemical composition specified does not have adequate cold-forming characteristics in the as-rolled condition, a suitable heat treatment, such as annealing or spheroidize annealing, may be necessary. Aircraft quality and magna-flux quality bars are those type of alloy steel bars which are used for critical or highly stressed parts of aircraft and for other similar or corresponding purposes involving additional stringent requirements such as magnetic particle inspection, additional discard, macro-etch tests, and hardenability control. To meet these requirements, exacting steelmaking, rolling, and testing practices are to be employed. These practices are designed to minimize detrimental inclusions and porosity. P and S are usually limited to 0.025 % maximum each. Many parts for aircraft, missiles, and rockets require aircraft quality alloy steel bars. Magnetic particle testing is sometimes specified for such applications. Some very critical aircraft, missile, and rocket applications require alloy steel bars of a quality attained only by vacuum melting or by an equivalent process. Structural quality is the nomenclature for hot rolled bars used in the construction of bridges and buildings by riveting, bolting, or welding and for general structural purposes. The general requirements for bars of this quality are given in applicable standards. Additional quality designations are used for the alloy steel bars intended for use for rifles, guns, shell, shot, and similar applications. These bars involve requirements for amount of discard, macro-etch testing, surface quality, or magnetic particle testing, as indicated in the product specification. These designations are (i) AP shot quality, (ii) AP shot magna-flux quality, (iii) gun quality, (iv) rifle barrel quality, (v) shell quality, and (vi) shell magna-flux quality. In addition to the C steel and alloy steel bars of structural quality, there are also several specifications covering high strength low alloy (HSLA) steel bars of structural quality. Bars of these steels offer higher strength than that of C steel bars and are frequently selected for applications in which weight saving is important. They also offer increased durability, and many offer increased resistance to atmospheric corrosion. Micro alloyed steel bars constitute a class of special quality C steels to which small amounts of alloying elements such as vanadium (V), niobium (Nb), or titanium (Ti) have been added. Micro alloyed steels in the as-hot-rolled condition are capable of developing strengths higher than those of the base C grades through precipitation hardening. In some cases, strength properties comparable to those of the quenched and tempered base grade can be attained. These steels are finding increased application in shafting and automotive forgings. Concrete reinforcement bars are available as either plain rounds or heat treated or deformed ribbed round bars. Heat treated or deformed reinforcment bars are used almost exclusively in the construction industry to furnish tensile strength to concrete structures. The surface of these bars is provided with ribs or protrusions, which inhibit longitudinal movement relative to the surrounding concrete. The ribs are hot formed in the final roll pass by passing the bars between rolls into which patterns have been cut. Plain reinforcement bars are used more often for dowels, spirals, structural ties, and supports than as substitutes for ribbed bars. Concrete reinforcement bars are supplied either, straight and cut to proper length, or bent or curved in accordance with plans and specifications. Concrete reinforcement bars rolled from billet steel are produced to the requirements of the applicable standards. For special applications that require ribbed reinforcement bars with a combination of strength, weldability, ductility, and improved bending properties, some standards specify HSLA steel. Reinforcement bars are also available rolled from rails and from axles of railroad cars. Some standards also cover uncoated high-strength steel reinforcement bars for pre-stressed concrete structures. The nominal values for bar diameter, cross sectional area, and weight per unit length are specified in the standards. Structural shapes, as stated previously, are flanged shapes 75 mm and greater in at least one cross-sectional dimension (smaller shapes are referred to as bar-size shapes) and are used in the construction of structures such as bridges, buildings, ships, and railroad cars. Included in this product category are regular structural shapes, such as standard beams, wide-flange beams, columns, light beams, joists, stanchions and bearing piles, and certain tees, along with special structural shapes, which are those designed for specialized applications and that have dimensions and/or values of weight per metre that do not conform to regular shapes. Bar-size structural shapes (angles, channels, tees, and zees with greatest cross-sectional dimension less than 75 mm) are considered to be in the merchant quality bar category rather than the structural shape category. The common method of designating sizes of structural shapes is as follows. Beams and channels – By depth of cross section and weight per metre. Angles – By length of legs and thickness in millimeter (mm) or, more normally, by length of legs and weight per metre. The longer leg of an unequal angle is generally stated first. Tees – By width of flange in mm, overall depth of web in mm, and weight per metre, in that order. Zees – By depth, width of flanges, and thickness in mm or by depth, flange width, and weight per metre. Wide-flange shapes – By depth, width across flange, and weight per metre, in that order. Most structural shapes are produced to meet specific standard specifications. Structural shapes are generally furnished to chemical composition limits and mechanical property requirements. Special requirements are sometimes specified for structural shapes to adapt them to conditions they will encounter during fabrication or service. These requirements may include specific deoxidation practices, additional mechanical tests, or nondestructive testing. Special shapes are hot rolled steel shapes made with cross-sectional configurations uniquely suited to specific applications. Examples of custom-designed shapes are track shoes for tractors or tanks and sign-post standards. The only type of standard shape in high production that falls in this classification is rail. Rails are produced from C steel to the dimensional, chemical, and other requirements of the relevant standards. The sizes of rails are designated in in kg/metre of length; rails are furnished in 40 kg to 65 kg sizes. The ordinary length of rails is 12 m or 13 m. These days rails are produced either in as-rolled or welded condition in multiple of 12 m or 13 m. Specifications for C steel tee rails for railway track, rail-joint bars and tie plates are covered in applicable standards. Light rails are available for light duty, such as in mines and amusement park rides, in sizes less than 40 kg/metre. Their specifications are available in the applicable standards. Crane rails generally have heavier heads and webs than those of railroad rails in order to withstand the heavy loads imposed on them in service. Crane rail sizes generally ranges from 29.8 kg/m to 147 kg/m.